Most commonly known as Mexican Fan Palm and has other common names such as the Sky Duster and the Cotton Palm. 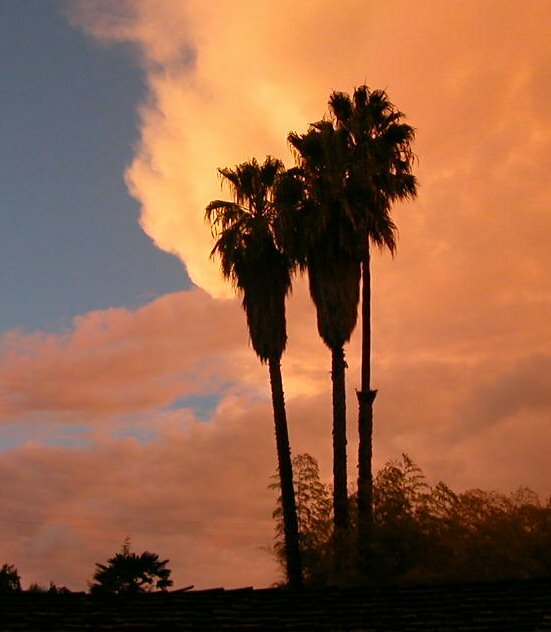 Mature Washingtonia robusta with their tall slender trunks and compact crown silhouetted against the Western sky are the quintessential California scene. 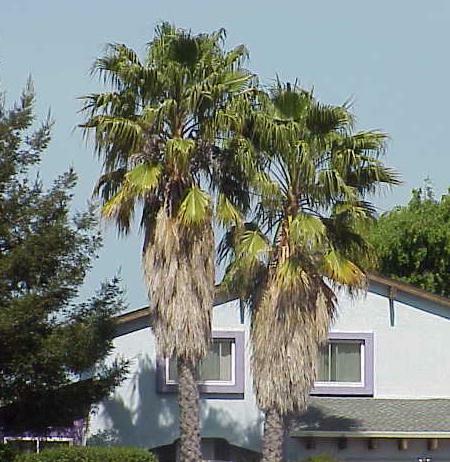 The two species of Washingtonia (robusta and filifera) are very closely related but quite distinct in appearance. Mexican Fan Palm has deep green leaves divided 1/3 into the blade usually with a tawny patch on the underside at the juncture with the petiole which is viciously armed with hooked reddish-brown thorns even at an early age. Trunks are flared at the base and can retain dead leaves in a "petticoat" extending to the ground for up to fifty years or longer before they naturally abscise and expose their slender grey trunks. Although similar but distinct in appearance, the two species differ radically in cultural requirements. 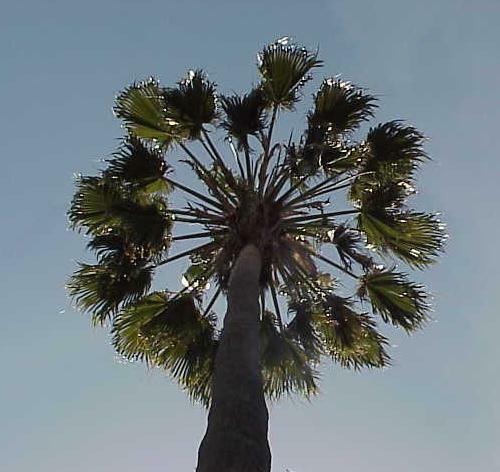 The Washingtonia robusta is native to coastal Baja and Sonora is extremely drought tolerant and will even grow on California�s cold fog-shrouded northwest coast. Grows well in full sun from seedling size and will eventually tower above all other canopy. However, native to the interior desert regions of California, Arizona and Sonora, is utterly intolerant of damp coastal conditions and actually requires a dry regime to thrive and best if irrigated deeply on a monthly basis. Leaf damage will occur at 20�F, but recovers quickly; hard freezes may completely kill even mature specimens. This palm is sometimes considered as a weed by some people due to their abundance, rapid growth rate (up to 6 ft per year when young) and high maintenance thatch. Propagation is only possible by seed, and hybridizes readily.